What is the BuzzSumo Chrome Extension? Check the share counts of any article while browsing the web. 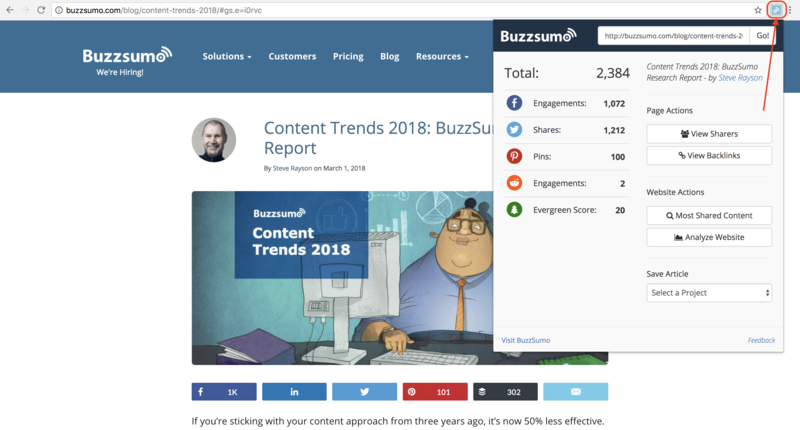 The BuzzSumo Chrome Extension is a powerful tool that allows you to check the real-time shares for any webpage you are browsing. The extension will display the number of engagements on Facebook, Twitter, Pinterest, and Reddit. It will also display the article's Evergreen Score. BuzzSumo customers can then dig deeper into the social data by clicking on any of the buttons on the right hand side to open up the web app. Click here to visit the Chrome store and install the BuzzSumo extension.